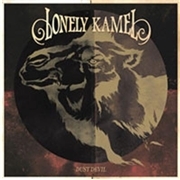 Norwegians LONELY KAMEL is in the business of stoner rock. Surely no-one doubts that after seeing the band name and the cover… The band has only been around for three years, still they have released two albums and shared stage with bands like MONSTER MAGNET and KARMA TO BURN. Blues, grooves and booze seems to be the band´s motto, and it works well enough for them to have a go at their third release. I wonder if tracks like “Grim Reefer” will be enough to make every listener high on the music alone? Bluesy stoner it is, straight from the opening chord of “Grim Reefer”, the hypnotic voice of guitarist Thomas Brenna fills my ears. They change pace once, but mostly the stubborn repetition of the likeable riff is the main concept. The archetypal stoner features are all here of cause, the extra blues is a bonus , or the occasional bass mania (of e.g. “Rotten Seed). The big thing about the album is highlighted in the hit like “The Prophet”. The doomy bluesy almost licking the audience´s ear music is spiced up with pace changes, a doomsday voice and the escalating pace towards the end. It worked for BLACK SABBATH all those years ago, and will work for LONELY KAMEL now. Otherwise stoner is often stoner, maybe the hard speed of releases and gigs is showing, as in the case of Iommi & Co way back? The closing track “Whorehouse Groove” is more fun than good and enjoyable. I hope for more of the band´s trademarks later on, after a break and some serious recording time.